Many people use Google's Chrome web browser for surfing the Internet because it's fast, stable and generally reliable. However, quite a few users have a problem with Adobe's Shockwave Flash plugin for the browser. It's likely not a Google problem, but an Adobe one. The software maker has dealt with numerous security issues with Flash, Reader and their other apps. This isn't a security hole, but simply a problem with the extension crashing and causing Chrome to have problems of unresponsiveness. Generally speaking, what users experience is the following: a web page or tab freezes in Chrome and that is followed by a message under the menu bar stating that "Shockwave Flash has crashed". This can also be followed by a popup from Chrome asking if you want to close "unresponsive tabs". It's annoying and slows the browser to a crawl. Fortunately, there is a fix for this common problem that is fairly simple for even a beginner user to handle. It may not solve all of Adobe's woes, but it should at least stop the plugin crash that ruins so many browsing experiences. Update: Google changed how plugins are managed in the Chrome browser. 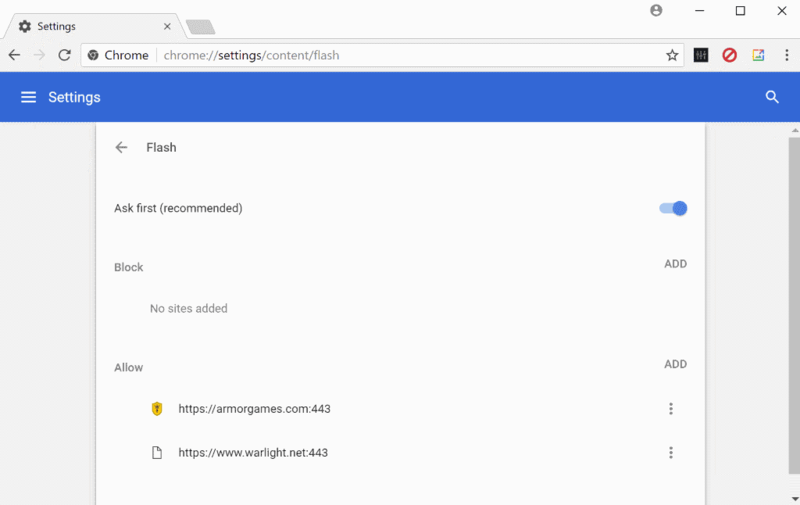 The chrome://plugins page is no longer available and the method described below does not work anymore because of it and because Google added Flash to Chrome internally. To get started, open Chrome and click in the address bar. Type "chrome:plugins" to open a page that will display all of the installed plugins. Scroll down to find the Flash plugin and pay attention to if there is more than one version installed. If you notice multiple versions then this is causing your problems. If you find multiple versions of the plugin installed then click the "+" toggle to expand the entries for the plugin. Now, disable Chrome’s internal Flash installation which is located in Chrome’s AppData folder. You will need to restart the browser for the change to take effect. This may not fix every Shockwave Flash problem, and some of you may find only one version installed. Hopefully, this will fix the issue for the vast majority of users. This has been driving me nuts on Linux, why some Flash games work, others threw an error. Once I disabled PepperFlash (Chrome’s built in version), all of the games that failed to work started working again. Completely agree that only one should be enabled, but I’m surprised by the solution. Having the built in Chrome version (pepper flash) as the only one enabled has been completely trouble free for me and is auto updated by Google when Chrome updates. Why are you suggesting disabling that and not the others instead? The Firefox flash plugin has been nothing but trouble for months now, and has forced me to abandon Firefox for now as Adobe seem to be incapable of fixing it properly despite several attempts. Perhaps my experience is not typical or I have misunderstood?? I had done that.It works. Sweet! This has been a major source of frustration for me and has been so prevalent that I’ve been toying with switching back to Firefox. Granted it has only been a day, but I haven’t had the problem since…Knock on wood! How do I load the correct one? where do I find it? Hi Alan, I desperately want to try this fix but I am confused at the first step. How do i “open Chrome”? Type exactly, or copy and paste, the following into the address bar . Cindy open Chrome refers to loading Chrome on your system, like you do when you use the browser to access Internet sites. You enter about:plugins in the browser’s address bar and hit enter afterwards. This displays all plguins, active or inactive, that the browser has detected. If that, for whatever reason is not working for you, do the following. Click on the settings icon at the top right of the screen (the three horizontal bars) and select Settings. Locate show advanced settings and click on it at the bottom of the page. Click on content settings under Privacy and scroll down until you see Plug-ins. Click on disable individual plug-ins there. This takes you to the same page. I only have one version enabled and it still crashes many times a day. Any other suggestions? Sweet it works now!! ive been trying to work this out all evening and found this, it helped out a lot. My shockwave crashes or will not respond and make my computer slow. I you can help i would love it. Thank you very much. I only have one type of Flash installed also, but it’s crashing on Facebook games. Would like to see a possible solution. Thx. What is ironic is that a Search for Flash Uninstaller takes you to an Adobe page that requires Flash! Many thanks, this worked for me. I had two versions of flash listed – after running the uninstaller, only ‘Adobe Flash Player – Version: 11.5.31.5’ was left. @ami: there is a space in there it’s either: about:plugins or chrome:plugins no spaces. For me there is no flash option showing, I may have funked it up myself whith installing chrome besides firefox on edubuntu 12.04LTS and then uninstalling the adobe flash plugin..
Iĺl let you know when i find out what is wrong with this. My plug in info look like below. i don’t see the file 2 and i still have the issue how do i fix this? The version looks out of date. If you only have one listed, you may want to try and install the latest version of Adobe Flash to your computer and disable the Chrome version instead. Before you do that I’d check if there is an update for Chrome available. Which version of the browser are you running? The webpage at chrome://%20plugins/ might be temporarily down or it may have moved permanently to a new web address. Error 300 (net::ERR_INVALID_URL): Unknown error. Did not help. I have 1 version only (Version: 11.5.31.137). Now what? Problem of shockwave flash crashes, only 1 flash player plugin. Which adblocker did you install? I installed it because I noticed that, just before the crash occured, in the lower left corner of chrome the status indicated that the browser kept on waiting for some advertising stuff. Ok I need some help please I have tried to figure this out for myself but as of now no luck. Been having yellow bar pop across that say something to the effect of the shockwave flash plugin is not working I need HELP on fixing this. I went into chrome by typing about:chrome it shows that I have 13 plugins. If you are using Chrome, you can make Shockwave Flash work (for a while at least) if you delete the Cache and Delete Cookies from “the beginning of time.” You may have to do this several times, whenever Shockwave Flash stops working. It works. If I disable the plugin I can see youtube videos, but. If I restart Chrome, the plugin is enabled again. I have to do it every time I start Chrome. Any way to save this settings? That still did not work. I used this method a while back and it worked great, but now when I disable Chrome’s internal Flash installation and restart my browser it’s re-enabled automatically when I have another installation enabled. It’s driving me insane! Anyone else having this problem? I’m using the latest Google Crome, Windows 7 64 bit. I’ve tried this fix but it hasn’t helped. Disabling the internal Flash version doesn’t take; when I re-start Chrome both Flash installations are enabled again. Is this due to some anti-hijack feature? Right now I just keep uninstalling chrome and re-installing. It seems to last a little longer for me that way, but eventually it goes back to hell. One thing to note is that I always have tabs open with AOL mail and Pandora. Those two are usually the first to crash. Google Chrome from a year and a half ago worked for me without a hitch and I always had about 20 tabs open at once.. I disable the PPAPI (out-of-process) Shockwave, restart Chrome and the PPAPI (out-of-process) Shockwave becomes enabled again. Is this suppose to be permanent? 2013 and your fix still works perfectly. I was about to give up on Chrome all-together. It used to be my browser of choice. Thank you! Where do I find this: Chrome’s AppData folder. I am at a loss. I have noticed only for the past two days and ONLY using AOL.com, I am getting the plugin not working or shockwave not working. Meanwhile, I am prevented from accessing any other sites via a Tab while the AOL.com site (via Chrome’s browser) is spinning. And then I am getting another error message asking if I wish to continue or kill the loading page. Since I have no problem using Safari to access AOL.com, it seems to me that it is only a Chrome issue affecting ONLY AOL.com’s website. Just like when you use Chrome to PRINT anything on the NYTIMES website, the printer-friendly view incorporates a box of “an upcoming and related article you might wish to read”—which covers about a square inch of 3 or 4 sentences at the right side of the printer-friendly document, once you print it. So I again must use Safari to print from the NYT because the “box” is not covering up several sentences on the doc I print. Thanks. I am really frustrated with both AOL.com and Chrome right now. Thank you very much! I’m a little surprised that the problem still exists in full after about 8 months of you publishing this. Folks, I’ve had the same frustrating problem with Firefox — the shockwave crash popup and the computer freezing. Roaming the internet, I must have tried everything suggested at least once and nothing worked. Finally, I downloaded the free wise program uninstaller. It pulls up a hefty list of “stuff” on the computer. I deleted the Adobe Flash player, restarted the computer then went to a music video on youtube. Right away a popup came up that said I had to download Adobe Flash Player — BUT the audio and video on the youtube played just fine without the Adobe download, so I just didn’t download it. It appears that Adobe Flash Player is now in the internet parcel (somehow) and we don’t have to download it now. If we do download it or have a downloaded version in the computer, it freezes up the computer. (Adobe Flash Player was only listed once on the uninstaller and that’s what I removed). Anyway, that’s what worked for me. No more freezes and no more popups. Oh and I have Firefox, google. This is an update to my previous posting about removing Adobe Flash Player. I’m still getting popups saying to download Adobe Flash but it is absolutely not needed. I’ve now roamed all over the internet, my email, and everything that was freezing, and my computer is fine now, no problems whatsoever with the freezing. The “download” or “update” Adobe Flash popup is still coming up but I just x out of the popup. Simple solution for Windows 7 to fix Shockwave Flash in Google Chrome. In Adobe Flash Player I disabled Shockwave Flash. Problem solved. I already had Adobe Flash Player installed in Internet Explorer, so that seems to eliminate the conflict.